Champions are a Community of Strong Leaders | UC Berkeley Student Affairs Community Blog! The Bay Area was filled with excitement the night the Golden State Warriors won the NBA Finals Championship on June 16, 2015. Whether you consider yourself a huge basketball fan or not, the energy that people emanated (right here on the Berkeley campus, many of you sporting your Dubs gear) was infectious! 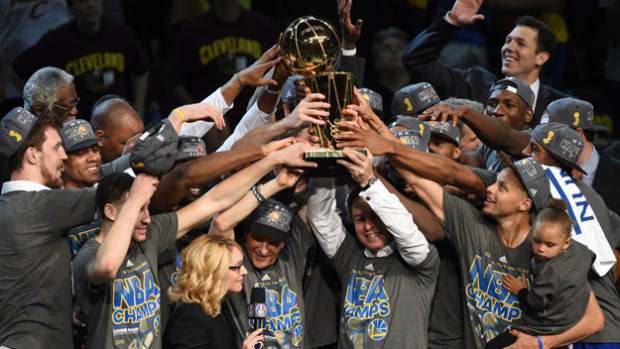 The Warriors intrigued us, as they just played differently compared to the Cavaliers. Their teamwork, support for one another, and praise for others on their team was noticeable. They were champions before even receiving the trophy. While the entire team deserves a huge kudos, we will focus on three individuals on the Warriors; these three showcase leadership lessons for all of us to practice in our own teams within Student Affairs. BUILD TRUST: Blogger Jason Evanish wrote a great article on Steve Kerr’s leadership abilities and how it helped the Warriors become champions. Evanish states that Kerr built trust and relationships with each of his team members before he made any changes, which helped Kerr understand individuals’ motivations, drive, backgrounds, etc. Tip #1: During your next 1:1, ask your staff member about what makes their hometown unique; how has growing up where they did shape them as individuals, and helped motivate them in their careers? GIVE KUDOS TO THE WHOLE TEAM: Blogger Brad Bridges focused on Curry’s leadership abilities and how it raised the entire Warriors team to the next level. Bridges states Curry always recognized the entire team in interviews and never proclaimed to be the best player in the world. Tip #2: The next time you are recognized for doing great work, ensure that you will name individuals on your team who helped contribute to the goal. PUT THE TEAM FIRST, AND POSITIVE RESULTS WILL HAPPEN: Andre Iguodala was removed from the starting lineup for the entire Warrior season. When asked by Kerr to come off the bench to start in the Finals, Iguodala swallowed his pride and put the team first. He went on to earn the NBA Finals’ MVP. Tip #3: One of your staff members may have strengths that you may be unaware of. Challenge your perceptions and delegate a responsibility to someone you may not necessarily call upon first. Undoubtedly, the sense of community, heart, and strong of team that the Warriors possessed enabled them to take home the 2015 NBA Championship. Who’s ready for 2016? What is your lollypop moment?